Frantic Stamper Precision Die - Gift Card Edge Holder. Gift cards make gift giving easy.... and with this die, you can make a quick insert to hold a gift card perfectly. We are offering you two versions of gift card holders. Both of our gift card holder dies have a unique feature. The die itself is a bit larger than a standard gift card. The outer edge of the die doesn't cut, but it will emboss a nice place holder for your card. The only part that cuts are the 2 notches that hold your gift card in place. On this version, the notches are at the center top and bottom. Also included in this set are the words "for you". You will need to snip this word die out before use (metal snips work great, followed by a metal file to remove the sharp edge). Our Frantic Stamper Precision Dies work in most consumer table top die cutting machines such as the Cuttlebug, Big Shot, vagabond, Boss Cut, and Grand Calibur. Some dies may require the use of a metal shim depending on your machine. Create beautiful pop-up cards with this die! The PopCard Template die is required for each PopCard Set. The template serves as the "spine" for the animal/person and slides through the slots that the PopCard Set dies cut. 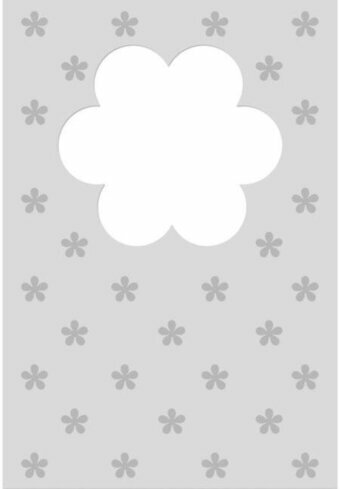 The template will pull the image up when the card is opened and fold flat when closed. The Frantic Stamper Barn Card Maker die is used to create a barn shaped card. The base die measures 4.25" x 5.5" and includes pieces you need to finish off the barn to your liking (doors, trim board, hay, straw bale, and various tools). Finish off your card with some of our animal dies scaled to match! 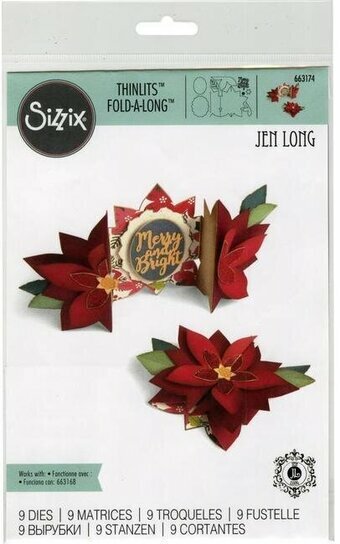 Die'sire 'Create-a-Card' Grand Entrance Metal Die by Crafter's Companion. If you like the look of intricate paper-cut or laser-cut shapes and want to create your own versions in next-to-no time then these specially designed cut and emboss dies are perfect for you. The Create-a-Card cut and emboss dies do not cut around the outside edge which means you can line them up with your folded card blanks to cut beautifully detailed aperture and lace designs for gorgeous creations. The way they've been designed means that you can add even more detail simply by running them through the machine twice - once to cut and then once, using the embossing mat, for stunning embossed results. These dies are also incredibly versatile as they can be used on any size of card blank, or can be used independently as with our decorative dies to create simply beautiful designs. This die measures approximately size 4.25" x 5.5" (outer measurements). I love the look of color blocking. This intricate die will cut a thin colorblocking frame measuring 3.75" x 5", while simultaneously cutting the squares and rectangles to fit. Cut this die from several colors and re-assemble to create your desired color block combinations. Remember to use this die in both the vertical and horizontal orientations, or turn it 180 degrees for many design possibilities. Due to the very intricate lines of this die, we strongly recommend using Stick-It paper when cutting it out. Tweezers and a gentle hand are a must. It's a bit tricky to work with, but well worth the effort in the stunning results. Our holly card band measures 5.75" wide x 1.55" tall. It can be used on an A2 size card in either direction. The holly peek-a-boo strip is flanked by a row of tiny circles on both the top and bottom, adding interest, but also allowing you to weave twine or gold cording through the holes for a stitched effect. Try coloring the holly and berries with copic markers, or leave the cut white for a tone-on-tone look. Ho Ho Ho! Santa is here! This Santa Suit Card Maker die is so much fun. You can create a full Santa Suit card front by layering the pieces onto a red card base. The die set contains pieces to create the collar, belt, belt buckle and suit trim. Cut the pieces from cardstock, felt, glitter paper, or other fun materials to add fun interest. Idea: Cut the collar and trim pieces out of white cardstock, then run the pieces through an embossing folder for texture. Cut the belt buckle from gold glitter paper or gold metallic foil paper. Add a little lapel decoration, or buttons to embellish Santa's Suit even more. 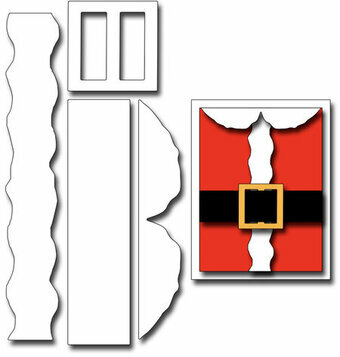 This die set makes a quick and easy Christmas card with lots of customization possibilities. Craft die from Impression Obsession featuring a Birthday Card. This is a set of 2 dies. The gift card foldover is approximately 3-7/8 x 5-1/4 inches unfolded. These are US-made steel dies compatible with most table-top die cutting machines. Spellbinders Nestabilities Card Creator brings a simple and unique solution to multiple crafting projects. The work is all done for you, no more measuring required. Simply...Choose your design, Assemble your pieces, Refine the details and you're Done! You can cut, emboss, deboss, and stencil with this cool Houndstooth pattern by Stacey Caron. Perfect for cards, tags, and more! A2 Scalloped Borders 2. A wonderful complement to the Card Creator die template series, this seven die template set features scalloped shaped edges with intricatecuts and full of beautiful swirled designs. 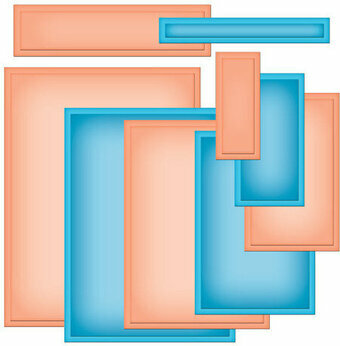 S5-182 A2 Scalloped Borders One set is also another beautiful design option for your edges. There are three different edge designs and four decorative inserts. All make continuous cuts and decorative edges, by matching up registration markson the ends of the die template (outer two marks are to cut a 5 1/2" card; inner two are for 4 1/4" card). Spellbinders Borderabilities Card Creator dies cut, emboss and stencil with a single die template. Approximate Die Template Sizes: 1: 6" x 1/8", 2: 6" x 3/4", 3: 6" x 3/4", 4: 6" x 5/8", 5: 6" x 7/8", 6: 6" x 1/4", 7: 6" x 3/8". Crafty-Ann craft die featuring an intricate card cover pattern. Size: 4" x 5 1/4" (102mm x 133mm). 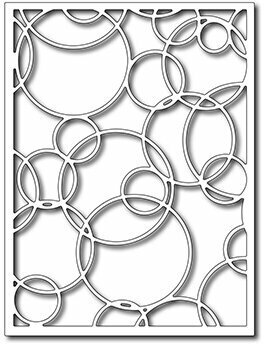 This Card Creator A2 Gate Gatefold Etched Dies set would make an awesome addition to your die cutting collection. Create a gorgeous gate fold card in a snap. Spellbinders Card Creator brings a simple and unique solution to multiple crafting projects. The work is all done for you, no more measuring required. Simply...Choose your design, Assemble your pieces, Refine the details and you're Done! This two piece set offers many options to create a pocket for your A2 (4.25 x 5.50 in) sized cards by folding the scored tabs and adhering them. 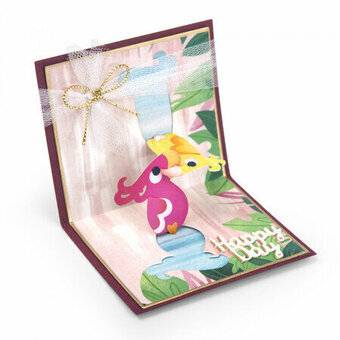 A header frame and insert is include for a beautiful design on the top edge. Tag can house a sentiment, a stamped image or other die cuts. A fabulous addition to your die collection. Approximate Size: 2.15 x 5.50". 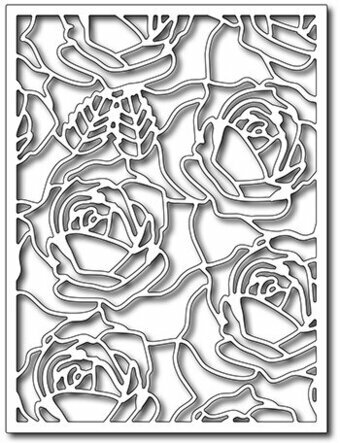 Card Creator Rebel Jewels Etched Dies Rebel Rose by Stacey Caron. 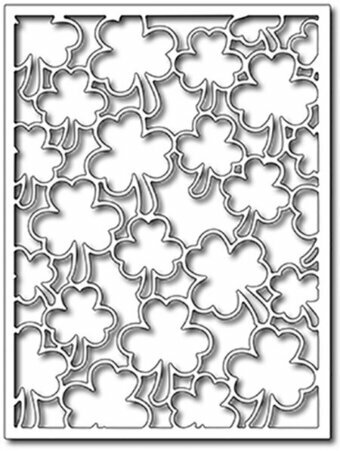 Spellbinders Card Creators cut, emboss and stencil with a single die template. This Rebel Jewels Etched Die set from Rebel Rose Collection by Stacey Caron includes two intricate frame designs and an accent piece. Tap into your rebellious side and make something beautiful with Rebel Rose, the striking new line of dies from Spellbinders Founder and President, Stacey Caron. Shake things up with her edgy, tattoo inspired line that will bring your projects to the next level. Approximate Size: Jewel: 1.15 x 1.15 in., Gem Frame: 3.20 x 3.20 in., Jewel and Chain: 5.50 x 5.50 in. Craft die from First Edition featuring the sentiment "Happy Birthday" with butterflies. Cut your own decorative card blanks with this selection of base card dies from Die'sire. Each set contains nesting dies, starting from 4.5" meaning you can create effortless card base shapes in a variety of sizes from only one cut. There are six dies per set making them great value for money, and they are sure to become a staple item in your craft stash. Approximate sizes: 4.5" x 5.75", 4" x 5.25", 3.5" x 4.5", 3" x 4.16", 2.75" x 3.75", 2.25" x 3". Kaisercraft die featuring the sentiment "Love". These steel dies will cut through cardstock, thin chipboard, felt, acetate, sticky back canvas, sandpaper, foam and much more! They work with virtually any die-cutting machine that will accommodate wafer-thin dies and are sure to become an essential ingredient in your paper crafting process. Start with the basics with this set to create all kinds of layering in your cards, pages and more! Create perfectly spaced layers ? 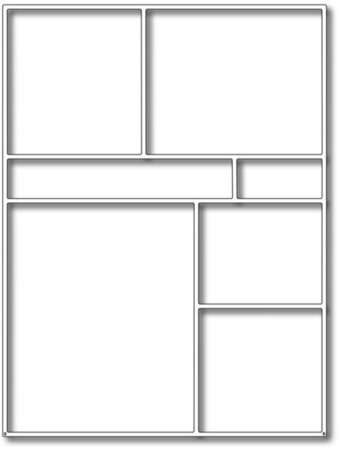 a larger basic size S5-131 A-2 Matting Basics A for a narrow matting option. Fancy coordinating die sets are available in the CARD Creator collection. Spellbinders Nestabilities Card Creator brings a simple and unique solution to multiple crafting projects. The work is all done for you, no more measuring required. Simply...Choose your design, Assemble your pieces, Refine the details and you?re Done! Sized in 1/8" and 1/4" increments, choose the size from Nestabilities Card Creator set A or B for perfectly spaced layers. Approximate Size: Long Rectangle SM: 3 3/8 x 1/2", Long Rectangle LG: 3 7/8 x 1", 1: 7/8 x 2 1/8", 2: 1 3/8 x 2 5/8", 3: 1 7/8 x 3 1/8", 4: 2 3/8 x 3 5/8", 5: 2 7/8 x 4 1/8", 6: 3 3/8 x 4 5/8", 7: 3 7/8 x 5 1/4". 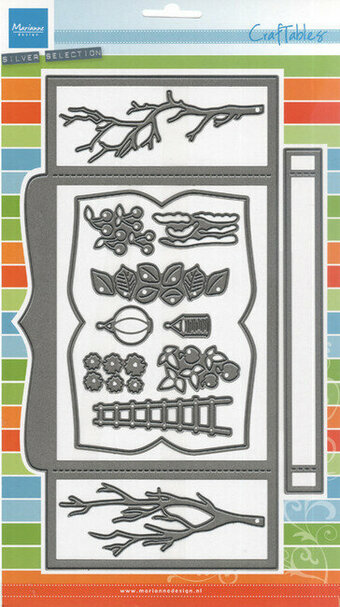 Spellbinders Shapeabilities Decorative Card Front bring quick and easy designs to your projects. In addition, they all have outside cut line to maximize your card making options. You can emboss, deboss and stencil with this fun pattern. Designed by Stacey Caron. 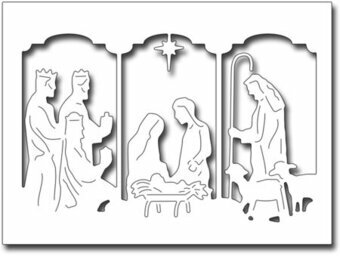 Depicting a serene Nativity Scene, this die features the on-trend style of a triple window design. Each of the 3 windows features a portion of the sacred occasion with the wise men bearing gifts, Mary, Jesus and Joseph in the center panel, and the shepperd with his sheep. The piece measures 3.5" x 4.75" making it the perfect size to layer onto a background card base. The die cuts in 1 piece, but includes accent cut lines to define the design and allow you to easily color or piece-cut for dimension. It also looks great done as a silhouette against an evening sky background. Create a card-sized wardrobe, complete with accessories to welcome a little one. The finished wardrobe measures 3.5" x 4.75". Included in this die set are small clothing, a tiny hanger, ball. spinning top, dolly and toy sailboat as well as the pieces needed to complete the wardrobe in many configurations (2 drawer sizes, knobs). Our Frantic Stamper Precision Dies work in most consumer table top die cutting machines such as the Cuttlebug, Big Shot, Vaggabond, Boss Cut, and Grand Calibur. Some dies may require the use of a metal shim depending on your machine. A wonderful complement to the Card Creator die template series, this seven die template set features bracket shaped edges with intricate details. There are four different edge designs and three decorative inserts. All make continuous cuts and decorative edges, by matching up registration marks on the ends of the die template (outer two marks are to cut a 5 1/2" card; inner two are for 4 1/4" card). Spellbinders Borderabilities Card Creator dies cut, emboss and stencil with a single die template. Approximate Die Template Sizes: 1: 6" x 1/4", 2: 6" x 5/8", 3: 6" x 1/4", 4: 6" x 5/8", 5: 6" x 1/4", 6: 6" x 5/8", 7: 6" x 1/8". Marianne Design Craftable: Box Card. Create a 3D Box card with this die set. 12 dies. Sizes: Smallest: 0.40" x 0.90", Largest: 5.20" x 9.85". 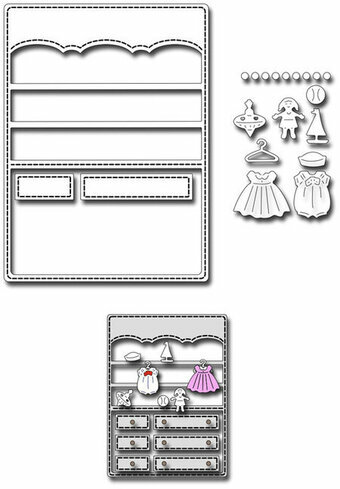 The Bridal Couple Card Builder die set is a unique set of dies used to create a shaped bride and groom card front. The main die measures 4" x 5.25" and cuts away the shape of the tux collar and dress. 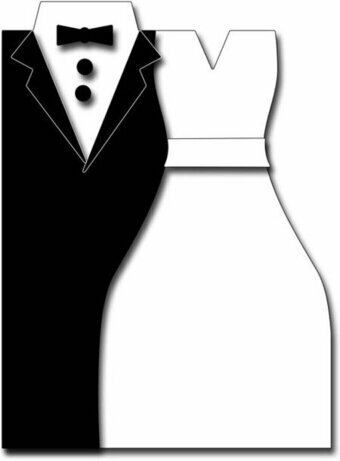 The second die cuts out the tuxedo, which will be layered over the base card. The rest of the dies are accent pieces including a belt for the dress, collars for the tux, a bow tie and buttons. Ideas for use: Emboss the "dress" portion with a pretty embossing folder for a lace effect on the bridal dress. Think outside the box by using a patterned paper on the dress and suit for a less formal card (prom, perhaps?). Add a flower to the tux. Add rhinestones to the belt for an elegant touch. Cut the bow tie from a bright red paper. Make bridesmaid cards matching their dress colors. With the Bump Card Scalloped Square, you can create fun layers, gatefold cards and more. The scalloped Square measures 2.5" and the entire die measures 5.5" long. Unlike the "Flip Card" die, the straight legs of this die cut the paper allowing you to create a straight edge with a bumped out scalloped square. The 2 layer squares measure 2.5" and 1.75". Pair this die with the Flip Card Scalloped Square die (FRA10110) for more options. This Card Creator Emmeline Treillage Etched Dies Venise Lace by Becca Feeken includes a set of two dies. 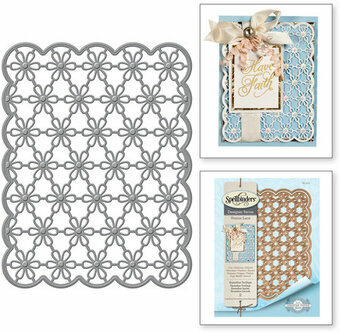 The sweet scalloped edge floral lace insert die and its frame is perfectly gorgeous. Venise Lace was inspired by the 17th Century Italian style of lace of the same name, which is created from needlepoint instead of embroidery. You can now use this gorgeous style to add some Italian flair to your projects. Spellbinders Card Creator brings a simple and unique solution to multiple crafting projects. The work is all done for you, no more measuring required. Simply Choose your design, Assemble your pieces, Refine the details and you're Done! 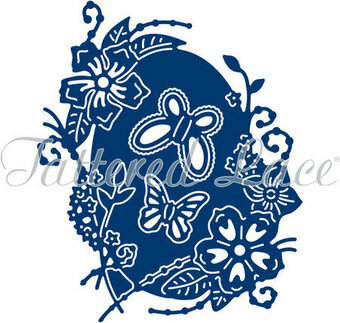 Approximate Size: Lace Insert: 4.00 x 5.25 in. 10.2 x 13.3cm, Lace Frame: 4.25 x 5.50 in. 10.8 x 14.0cm.